Patrick & Topaze McCaffery - Taproot Garden Design & Fine Gardening "The air conditioning unit is hidden by beautiful Ipe wood fencing. The Ipe wood raised planter box produces plenty of peppers and herbs for the family." 10. 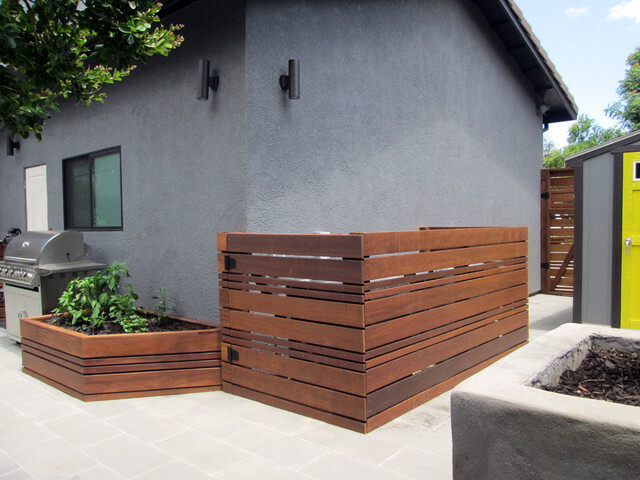 Conceal AC Units With Neat FencingAn open-topped wooden enclosure makes for a smart screen for air-conditioning units outside this garden in Mountain View by Taproot Garden Design & Fine Gardening. The open slatting of the ipe wood and the lack of a roof ensure plenty of ventilation for the units while providing an attractive screen. The raised bed, made from the same wood, provides a growing spot for peppers and herbs.